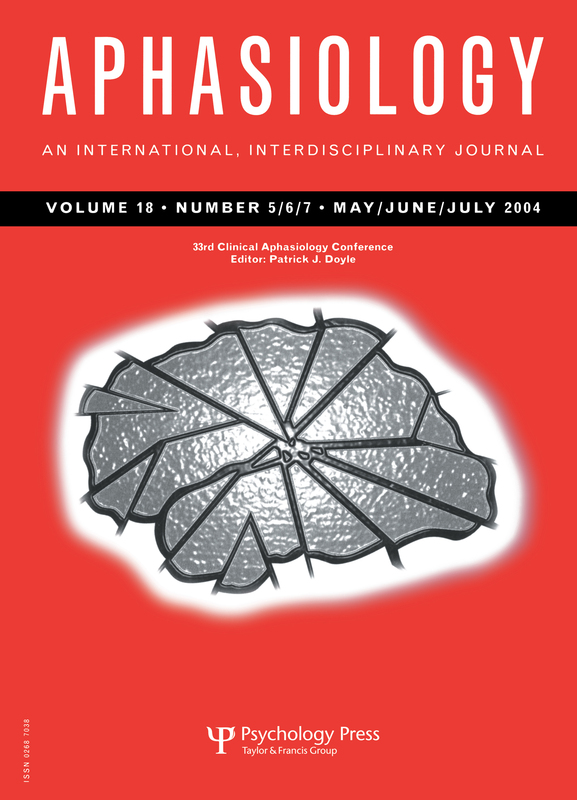 The papers that appear in this special edition of Aphasiology were selected based upon their theoretical importance, clinical relevance, and scientific merit from among the many platform and poster presentations comprising the 33rd Annual Clinical Aphasiology Conference convened in Orcas Island, Washington, USA during the last week of May 2003. Each paper was peer-reviewed by the Editorial Consultants and Associate Editors acknowledged herein consistent with the standards of Aphasiology and the rigours of merit review that represent this indexed archival journal. L.A. Edmonds, S. Kiran, Confrontation Naming and Semantic Relatedness Judgments in Spanish/English Bilinguals. T.R.D. Fossett, M.R. McNeil, P.J. Doyle, H. Rubinsky, S. Nixon, W. Hula, J. Brady, Assessing the Validity of Multiple-choice Questions for RAPP Story Comprehension. A.C. Georgeadis, D.M. Brennan, L. M. Barker, C.R. Baron, Telerehabilitation and its Effect on Story Retelling by Adults with Neurogenic Communication Disorders. B. Hallowell, N. Douglas, R.T. Wertz, S. Kim, Control and Description of Visual Function in Research on Aphasia and Related Disorders. E.M. Hickey, M.S. Bourgeois, L.B. Olswang, Effects of Training Volunteers to Converse with Nursing Home Residents with Aphasia. M. Strauss Hough, Generative Word Fluency Skills in Adults with Parkinson's Disease. M. Strauss Hough, Naming and Category Concept Generation in Older Adults with and without Dementia. N. Martin, R. Fink, M. Laine, Treatment of Word Retrieval Deficits with Contextual Priming. M.R. McNeil, P.J. Doyle, W.D. Hula, H.J. Rubinsky, T.R.D. Fossett, C.T. Matthews, Using Resource Allocation Theory and Dual-task Methods to Increase the Sensitivity of Assessment in Aphasia. R.K. Peach, P.C.M. Wong, Integrating the Message Level into Treatment for Agrammatism Using Story Retelling. S.L. Small, A Biological Model of Aphasia Rehabilitation: Pharmacological Perspectives. J. Wambaugh, C. Nessler, Modification of Sound Production Treatment for Apraxia of Speech: Acquisition and Generalization Effects. N. Martin, R. Fink, M. Laine, Treatment of Word Retrieval Deficits with Contextual Priming. D.A. Wiener, L. Tabor Connor, L.K. Obler, Inhibition and Auditory Comprehension in Wernickes Aphasia. S.M. Antonucci, P. Beeson, S.Z. Rapcsak, Neroanatomical Substrates of Anomia in Patients with Lexical Agraphia. K.L. Haley, Vowel Duration as a Cue to Postvocalic Stop Voicing in Aphasia and Apraxia of Speech.